Channel your inner warrior princess with these statement accessories! Jewellery has evolved from being an adornment or a meaningful fashion accessory to one that is a definitive expression of style and mood. From neck-pieces to headgear and hand armour, we bring you unconventional statement pieces that steal the show. Matte gold face mask with butterfly detail, antique gold butterfly neck-piece, both by Vasundhara, Kolkata. Headgear with spikes, by Manish Arora, New Delhi. Cage choker in gunmetal, from Begada, Mumbai. Custom-made diamanté and pearl earrings, by Ankita Tewari, for AéTeē, New Delhi. Pearl ear cuff with spikes, from Outhouse, Noida. 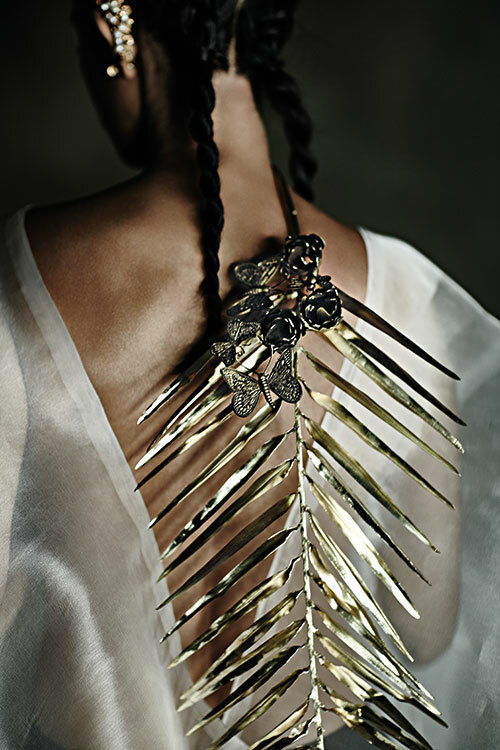 Matte gold leaf necklace, by Vasundhara, Kolkata. 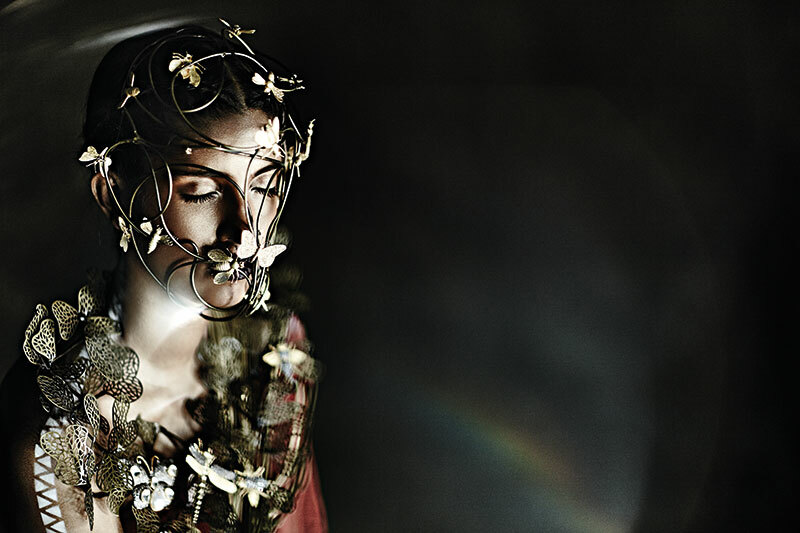 Gold headpiece, by Kanika Saluja, for Anaikka, New Delhi. Blocks of Red and Blue necklace, by Paola Valera, at cultcurators.com Beaded nose stud, stylist’s own. Leather hand armour with spikes, by Manish Arora, New Delhi. 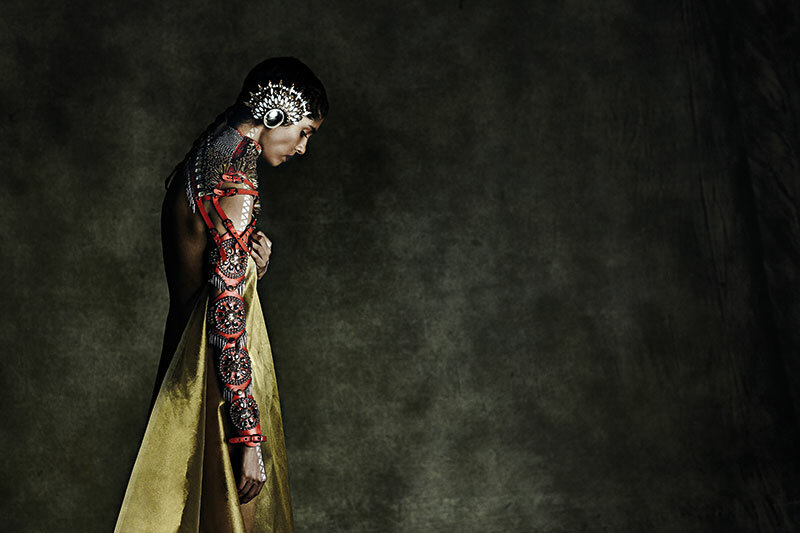 Crystal-embellished ear cuff, by Ankit Khullar, for Purab Paschim; concave mirror ear cuff, by Felix Bendish. Both in Mumbai.